The Lamy Safari comes packaged in a simple, yet well designed, cardboard sleeve. 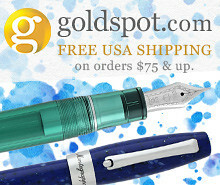 Lamy's Safari line is a go-to recommendation for a "first fountain pen." Many people, like me, come to Safaris later, after they have been using (much more expensive) fountain pens for a while, only to realize that the Safari is a flat-out good pen, irrespective of its price range. If you don't have one in your rotation, you should reconsider, provided the design works for you. Like the Lamy 2000 (perhaps my favorite fountain pen of all time), the Safari sports an iconic design. Also like the Lamy 2000, the Safari has remained largely unchanged since its debut in 1980. 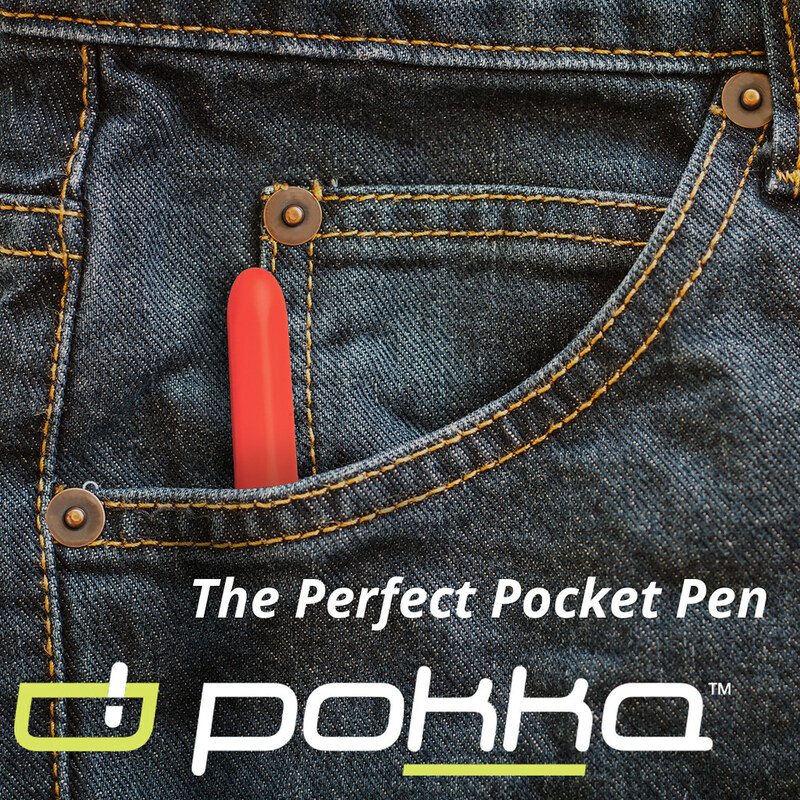 The pen is relatively rugged, made of injection-molded plastic, and will hold up to pretty robust pocket carry and daily use. 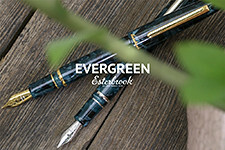 It's earned a reputation as a good daily user; a "knockabout" fountain pen for those who are hesitant to tote their more expensive pens around town with them. The Safari also comes in numerous colors, including matte charcoal (pictured), shiny black, red, blue, white, and yellow, along with various "limited edition" colors that change annually. This year's L.E. Safari is neon coral; last year's was neon yellow. Profile shot of the Safari. You can see how the sides of the triangular section are flat, forming a ridge along the top. The Safari sports a characteristic triangular grip section, which is either loved or hated by users. 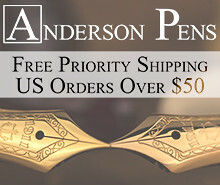 Frankly speaking, your opinion of the grip section will either make or break this pen for you. I don't mind, because I apparently grip my pen in a manner that is "Lamy-compatible," but I know several people who simply can't use this pen because the section hurts their fingers. 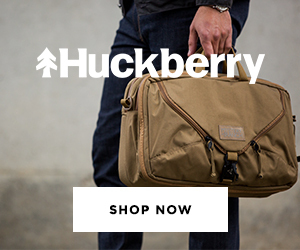 At the $30 price point, the Safari is not going to break the bank if the purchase doesn't work out, but this may be a "try-before-you-buy" purchase if you have never held a Safari or an Al-Star (the slightly larger, more expensive aluminum version of the Safari). Fortunately, Safaris are relatively easy to find. For example, in my area, a local luggage store that carries a very limited pen selection stocks Safaris. How I hold the pen, which is fairly comfortable. 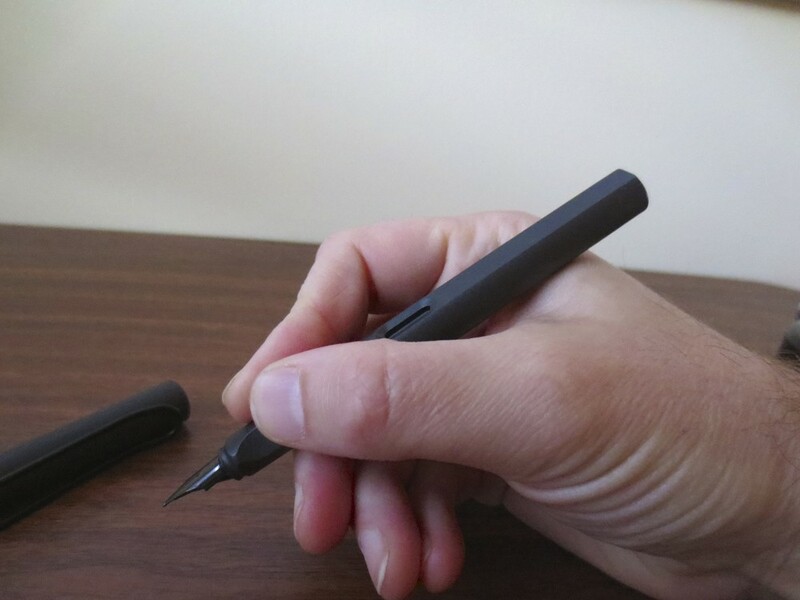 Yes, the nib on the Charcoal Safari is black! Finally, the Safari is a cartridge/converter pen. The pen comes with a single cartridge of Lamy blue ink, but a converter must be purchased separately for a few dollars more. 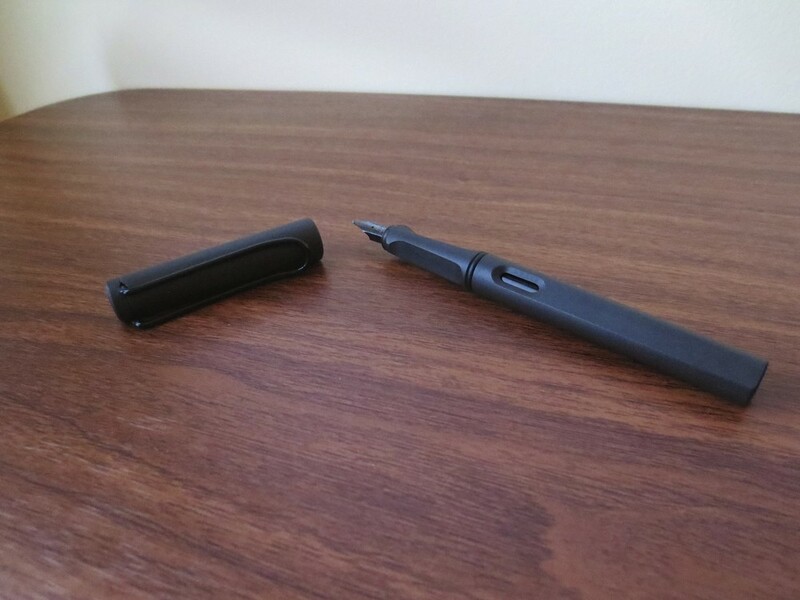 The Safari uses Lamy's interchangeable nibs that also fit other Lamy pens, including the Al-Star, the Vista (basically, a clear Safari demonstrator), and the Studio. All Safaris come with stainless steel nibs, but if you're inspired to trick out this pen I imagine that the gold nibs featured on some of the more expensive Studio models would also fit the Safari. There's no need to spend that extra money, however, because for the most part, Lamy's Steel nibs are perfectly satisfactory. I've had the best luck with the medium nibs, which write a traditional "western medium" line. The fine and extra-fine nibs can be scratchy, and sometimes I can barely tell a difference between them. If you are interested in trying italic nibs, Lamy offers 1.1 and 1.5 mm options, and they are very good for the price point. Is the triangular grip section going to bother you? If you think that it might, and "grip guides" on pens and pencils haven't worked for you in the past, I would try to find a Safari to test out before you place an order. Do you mind having a "funky looking" pen? With it's grip section and oversized cap and clip, the Safari is "unique" looking, to say the least. You will get questions about this pen, and people will want to use it. Are you worried you will be tempted to buy more than one? Here's what I find to be the main issue--because Safaris (and AL-Stars as well) are not very expensive, the siren song of the "limited edition" becomes very hard to resist. This year's limited edition AL-Star in Copper Orange is already on its way to me. But once these issue are resolved, get a Safari. It's a great pen. It's also one that I have owned once before, sold to finance another purchase, and immediately regretted letting go. I'm glad this one's back in my pen case. Lamy's iconic ink bottle with the blotter paper holder in the base. The ink that I used to review this pen was Lamy black. 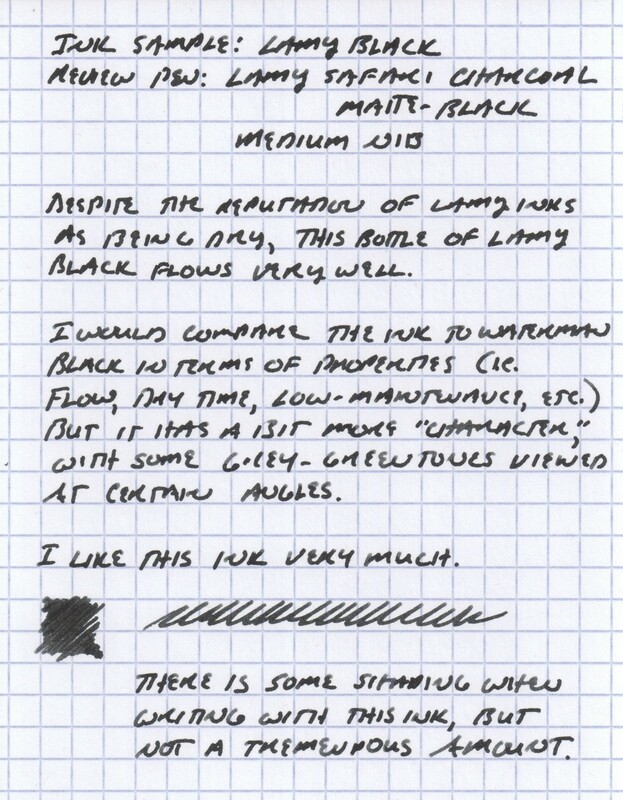 Lamy black gets very little "press" on the pen blog circuit, probably because it's one of the most utilitarian inks out there. It does, however, flow extremely well and shades to some degree. While many people don't find shading desirable in a black ink, Lamy black has some additional character, meaning that it has some deeper green/purple undertones. I've also enjoyed the bottle, which comes with a roll of blotter paper that you tear off and use to wipe the nib after you fill the pen. The ink has worked well on most paper that I've used over the past week, and especially in my Baron Fig notebook that has become my daily companion. 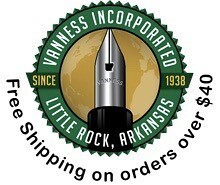 This pen and bottle of ink was provided to me for review purposes at no charge by Ron at PenChalet. 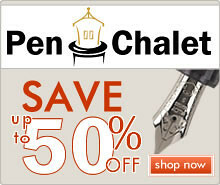 PenChalet carries a wide variety of Lamy prducts, including the 2000, the Safari, the AL Star, and others. 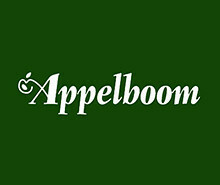 Their prices are always extremely competitive, and they stand behind the quality of what they sell.